No one won the jackpot during the US Powerball draw last Saturday, December 16—which means that the $249 million jackpot will now be worth at least $269 million, with a cash option worth $171.3 million, come Wednesday, December 20. 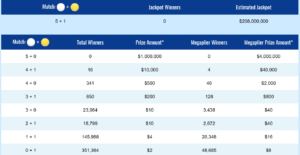 As for secondary winnings, there were 956,643 who won at least $4 each—with one winner matching all 5 white balls, making him $1 million richer. A Lafayette attorney named Jean Breaux Jr. has claimed the $191 million Powerball jackpot won during the October 25 draw this year on behalf of family of three who wished to remain anonymous. They chose the lump sum option of $119 million which meant that, after state and federal taxes, they would be taking home nearly $84 million. A New Zealand Powerball player who bought their ticket at Countdown Church St., Timaru, is now the sole winner of the $7,250,000 jackpot for the December 16 draw. 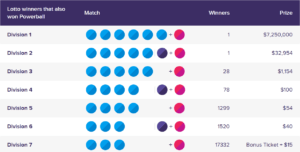 There were three other winners of the New Zealand Lotto’s First Division prize, though none of them had the Powerball so each won only $250,000. Like the US Powerball, the Mega Millions lottery has rolled over yet again. The draw last Friday, December 15, did not yield any jackpot winners. What would have been a $208 million win for a lucky player, will now be worth $223 million, with a lump sum option of $141 million, come Tuesday, December 19. While there weren’t any jackpot winners—nor any second placers, for that matter—there were some 238,643 players who won at least $4 each. Lottery fans may have a very merry Christmas ahead of them because another big lottery has rolled over. This time, it’s the Euromillions jackpot. No grand prize winners were found during the draw last Friday, December 15, which means that come Tuesday, December 19, the jackpot—which was supposed to be €126.4 million—will now be worth an estimated €135 million. Overall, there were 2,584,531 winners of at least €4 each—though there weren’t any second-place winners. While there was no grand prize winner during last Friday’s Euromillions draw, there was one lucky winner of the Euromillions Plus draw. The player from Kildaire—who matched the lucky numbers 3-10-37-48-50—won a cool €500,000. Euromillions isn’t the only National Lottery game that experienced a rollover. The National Lottery Lotto draw during last Saturday, December 16, did not yield any jackpot winners. 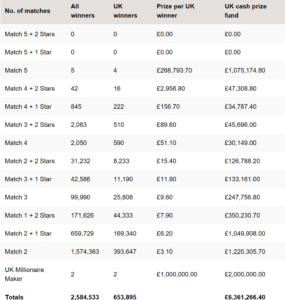 What would have been a £17.37 million haul will now be worth £18.4 million come Wednesday, December 20. Meanwhile, there was also no jackpot winner found for the UK Thunderball. There was, however, one winner of the second-tier prize—which means the lucky punter would be taking home £5,000. 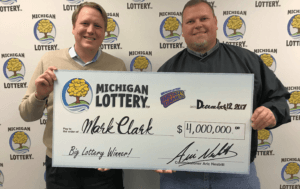 Mark Clark, of South Rockwood, Munroe County, was on the verge of tears when he learned he had won a whopping $4M from the Michigan Lottery’s Millionaire’s Club scratch-off card. Nevertheless, he managed to pull it together and drive out to share the good news with his parents. Clark chose the lump sum option of around $2.5 million, instead of going with an annuity payout. He plans to purchase new cars for himself and his son—as well as a bass boat and extra special gifts for his family this Christmas.